At the outset of this series, I mentioned that we didn't have time to talk with all 72 families during the busy finals weekend. Instead, we chose families that either had an interesting angle, such as the Holcers or the Abramses, or could provide insight on one of the volunteers we were following for the feature film. The latter was the case with McKinley Fitzgerald and her mom, Jennifer. McKinley provided us with a good sound bite about Lynn Rutherford-Snow, Virginia's state director, that we used in the film. 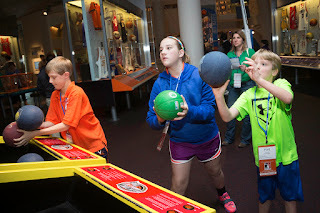 McKinley (center) takes aim during the party at the Hall of Fame. 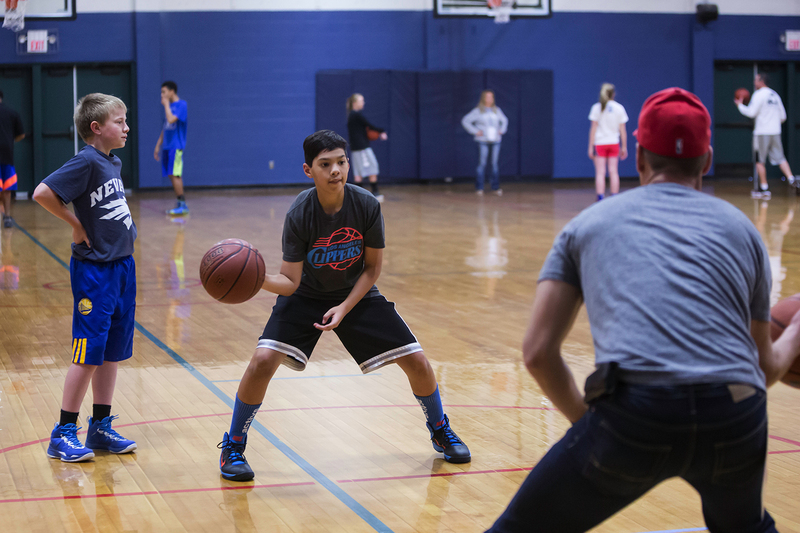 But we repurposed their interviews for the #TrueGritTuesdays series, because they both spoke to the role we as Elks play in developing grit (beyond the obvious contribution of the Hoop Shoot as a means). Grit is the courage and resolve to keep going in the face of hardship. You can't force that. You can't force people to be tenacious. You can't force them to persevere. That comes from within. We don't teach grit, they develop it. The participants have to learn our program's lessons for themselves. But as volunteers working with kids through the Hoop Shoot program, there are things we can do to help them become grittier. We can help them set goals. We can make the experience fun. Do those four things, and the rest will take care of itself. In her first year in the program, McKinley reached the Virginia state contest. It was quite a run, but defeat there crushed her spirit. She was ready to quit. Lynn Rutherford-Snow wouldn't let her. The state director who had treated her like family, who had made her feel special, urged her to keep trying. She kept setting goals. She kept working hard. She kept having fun. Because she knew that Lynn and all the Virginia Elks were behind her, the way families are. And all the while, without even really knowing it, McKinley was becoming grittier. In case you haven't seen it yet, here's All in the Elks Family.